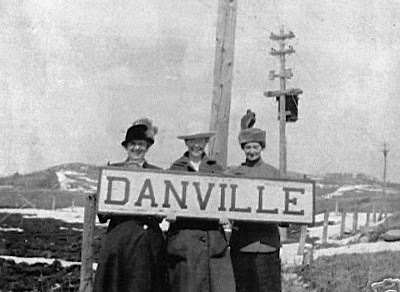 DANVILLE – This year, the historic town of Danville celebrates its 150th anniversary, but few residents know the origin of the name for their town. Sure, a few know that it came from the town of Danville, Vermont because of pioneers who came north of the border in the early 1800s at the invitation of the Lower Canada governor who offered them free land to settle. But over the years, many residents assumed the name had to do with someone named Dan. Few realized the name had a more complicated past and is not an English name, but rather a derivative of a famous geographer and map maker from France. In the 1790s, the founding father of Vermont, Col. Ethan Allen, was searching for names for some of towns he wanted to establish in his newfound state, which had broken away from the larger state of New York. Because the northern half of the state had once been the lower part of the former New France up until the British conquest in 1760, the French influence on the state was still strong. After the Americans won their independence from the British in the early 1780s with the help of the French government, Allen wanted to thank them by using French names for some towns. Under the advice of expatriate French author Michel Guillaume Jean de Crevecoeur, Allen took the name Danville from Jean-Baptiste de Bourgignon d’Anville, a cartographer for the French king Louis the fifteenth. D’Anville was famous in France for redrawing most of the world maps based only on reports from explorers he recieved at his office in Paris. He died in 1782 at the age of 85. The name was anglicized by removing the apostrophe and leaving the D in place at the front of the name. Despite his working for the King of France, d’Anville did not have an aristocratic title, unlike that of Duc d’Anville, the son of a former Huguenot who became a vice-admiral in the French navy. Known as the Duke, this d’Anville tried to retake Acadia from the English in 1746 using an amarda of ships and a regiment of soldiers from France. But before he could attack the English in what is now Nova Scotia, the hapless aristocrat died of a mysterious poisoning at Cape Breton. The two d’Anvilles do not appear to have been related, given that the map maker was a Bourguignon and the vice-admiral was from the Rochefourauld family. The story would have ended there if not for the exporting of the name to Quebec via the first Vermont pioneers to leave and form a similar town in the Eastern Townships 150 years ago. But an extensive look at our neighbour south of the border indicates there are also 17 Danvilles in as many states in the U.S. Most of the Danvilles are small communities similar to those in Danville, Quebec and Danville, Vermont. The next closest Danville is in New Hampshire, about an hour’s drive north of Boston. Besides these two New England towns, there are Danvilles in the states of Alabama, Arkansas, California, Georgia, Illinois, Indiana, Iowa, Kansas, Kentucky, Missouri, Ohio, Pennsylvania, Virginia, Washington and West Virginia. What is not known is why these other states chose the Danville title for their towns. Do they know the origin of the name? Past attempts to contact these towns via the internet have not been successful. The Record will endevor to find out for a future article. EDS : Pics of the historic characters are hard to find. Allen is on wikipedia, but Bourguignon d’Anville is not. Senator Jane Kitchel, Paul Chouinard, Alice Hafner and Stephen McDougall in Danville, Q.C. This summer, when our Danville, VT, tour went to Danville, QC, one of the events we enjoyed was a display of historical photos set up in a room in the school. Several historical articles were on display in the hall as well, and this one was pointed out several times as a new piece of information about our town’s name. The author of the above article, who writes for the local paper in Danville, QC, was recently at Autumn on the Green with a contingent of citizens at a booth sharing information about their town and it 150th anniversary. We hope you enjoy this article; McDougall says he has more! This article was republished in the November, 2010, issue of The North Star Monthly. This entry was posted in Historical sites, NSM articles, Uncategorized and tagged danville, name, quebec. Bookmark the permalink. I live in Danville, California. Would you like me to find out from our town why they came up with the name Danville? I’ll get Historical Hannah and Investigator Iris on the trail. The early issues of the “North Star” and other newspapers as well as early histories may be a good place to start.The cartographer name is interesting but not nearly romantic enough given the relatively short life of Admiral D’Anville. Currently I have been researching James Richard Hope Pearson, ‘manager of Asbestos and Asbetic Co’, emigrated from London 1897, was a lodger in Danville 1901, married Adelaide Frances Seaton in 1903, and appears on the 1921 Census. What I would like to know is more about his involvement with the asbestos company and further details about current members of his descendants with whom I can communicate. My name is Danville. I live in South Africa. I wish to one day visit a town called Danville in America.